Multilevel modeling is an increasingly popular multivariate technique that is widely applied in the social sciences. Increasingly, practitioners are making instructional decisions based on results from their multivariate analyses, which often come from nested data that lend themselves to multilevel modeling techniques. As data–driven decision making becomes more critical to colleges and universities, multilevel modeling is a tool that will lead to more efficient estimates and enhance understanding of complex relationships. 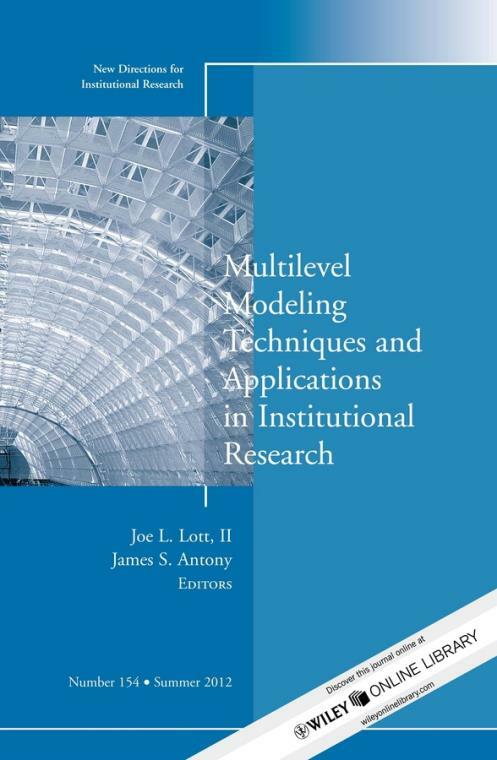 This volume illustrates both the theoretical underpinnings and practical applications of multilevel modeling in IR. It introduces the fundamental concepts of multilevel modeling techniques in a conceptual and technical manner. Providing a range of examples of nested models that are based on linear and categorical outcomes, it then offers important suggestions about presenting results of multilevel models through charts and graphs. This is the 154th volume of this Jossey–Bass quarterly report series. Always timely and comprehensive, New Directions for Institutional Research provides planners and administrators in all types of academic institutions with guidelines in such areas as resource coordination, information analysis, program evaluation, and institutional management. 1. Hierarchical Data Structures, Institutional Research, and Multilevel Modeling 5Ann A. O Connell, Sandra J. ReedThe authors provide an overview of hierarchical linear modeling (HLM) and highlight the particular advantages of HLM for those involved in institutional research. 2. Introduction to Estimation Issues in Multilevel Modeling 23D. Betsy McCoach, Anne C. BlackThis chapter is a conceptual, nontechnical overview of estimation and model fit issues in multilevel modeling. 3. Using Existing Data Sources/Programs and Multilevel Modeling Techniques for Questions in Institutional Research 41Joe P. King, José M. Hernandez, Joe L. Lott, IIThis chapter examines the data sources that lend themselves to institutional research and multilevel modeling and briefly describes the various software packages that handle multilevel models. 4. Multilevel Models for Binary Data 57Daniel A. PowersThe author provides a brief overview of models with binary outcomes and carries out two example multilevel analyses with binary outcomes on institutional data. 5. Cross–Classified Random Effects Models in Institutional Research 77Laura E. MeyersThis chapter provides one example of how cross–classified random effects modeling can be used to assess faculty gender pay differentials in higher education. 6. Multilevel Modeling: Applications to Research on the Assessment of Student Learning, Engagement, and Developmental Outcomes 95Pu–Shih Daniel Chen, Kristina CraggUsing data from a four–year university located in the southeastern United States, this chapter provides an example of how to use multilevel modeling to study the effects of a learning community on student learning and discusses some strategies for reporting multilevel modeling results. 7. Multilevel Modeling: Presenting and Publishing the Results for Internal and External Constituents 111Gary R. Pike, Louis M. RocconiMultilevel modeling provides several advantages over traditional ordinary least squares regression analysis; however, reporting results to stakeholders can be challenging. This chapter identifies some useful principles for reporting results.